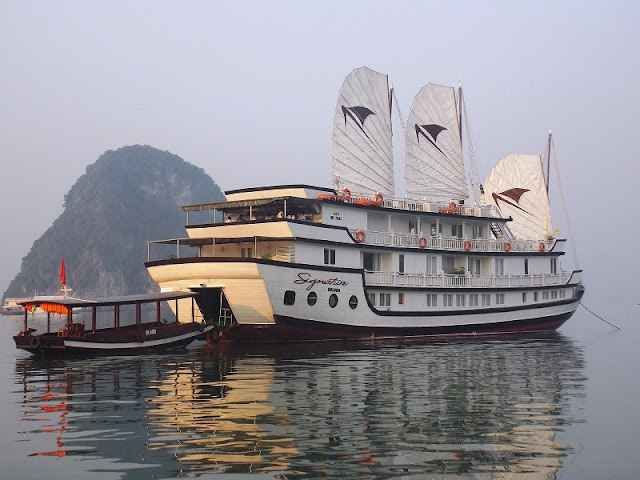 Home > Halong Bay Travel Guide > The boat in Halong Bay is waiting, are you coming? The boat in Halong Bay is waiting, are you coming? Halong Bay, Vietnam is famous for its scenic rock formations. A UNESCO World Heritage site, Halong Bay is often included in lists of nature wonder. Halong Bay is a magnificent feat of nature that rarely fails to impress. As one of Vietnams premier tourist destinations, Halong Bay is also famed for its junk boat cruise and sea kayak expeditions. The region is also renown for scuba diving, rock climbing and hiking in mountainous Cat Ba nattional Park. A cruise on the charming Halong Bay is a popular activity and takes you closer to the limestone formations, natural grottoes and floating villages. This is what everyone is expecting in this place. By this way, they could admire the bay much closer up in a more special manner. If you stay a night on the cruise ship, you can observe Halong Bay at night. When all boats are docked, you see only lights, this is a striking view. In the morning, when you wake up, first thing you will do is sneaking behind your curtain and watch the sunrise. There are various types of boats available in Halong Bay. If you're unsure which to chose, check out with travel companies such as Vietnam Typical Tours to find inspiration and seek advice that will help you find the most suited one for you. However, regardless of your choice, try it at least one night. You will never regret about this experience! Love it? Let’s book a Halong Bay cruise and enjoy your holiday!